"Beyond labels" is usually shelter double-speak for "we don't like being compared to No Kill metrics". Like "working together" these terms are generally designed not to give clarity, but to help organisations to wiggle out of presenting facts and figures to the public, usually because these facts and figures are damaging to the reputation of said organisations. At the same time these terms stifle any debate on policies, by asserting that 'arguments' inside the animal sheltering movement harms organisations and by extension, the animals they care for. Except of course, historically, secrecy about pound and shelter operations has been terrible for pets. ‍A lot of killing has been done over the decades behind closed doors, quite deliberately out of sight of the public. Only through the work of advocates exposing inefficient, inept or even bloody-minded council pounds (and charity pound management) have pet lovers been given the opportunity to have input into how their councils manage stray and homeless pets. In Australia, the number of local councils who run effective pet rehoming programs, not almost exclusively reliant on community rescue groups could be counted on finger and toes. If it weren't for rescue groups doing an extraordinary amount of heavy lifting - especially in rural and regional areas - the current not great situation for pound pets in Australia, would be unimaginably worse. And rescue groups, because they care, offer their services free to councils, and are often actually paying council for the privilege of saving pets that pound would otherwise kill. At the same time, the RSPCA is pulling out of pound contracts across the nation, as they realise that without being able to kill pets for convenience with impunity, providing council's pound contracts simply doesn't make financial sense. Saving pets is resource intensive. This of course leaves a huge need that is often being filled by community rescue groups. Rescue groups have never been more vital to keeping homeless pets safe. Which brings us back to Dr Haston and his presentation on the future of animal sheltering. Dr Haston has given these presentations several times since 2015, with one from June this year available on Youtube. And if you want to see many of the excuses from shelters for their high kill rates given a modern makeover then check it out. 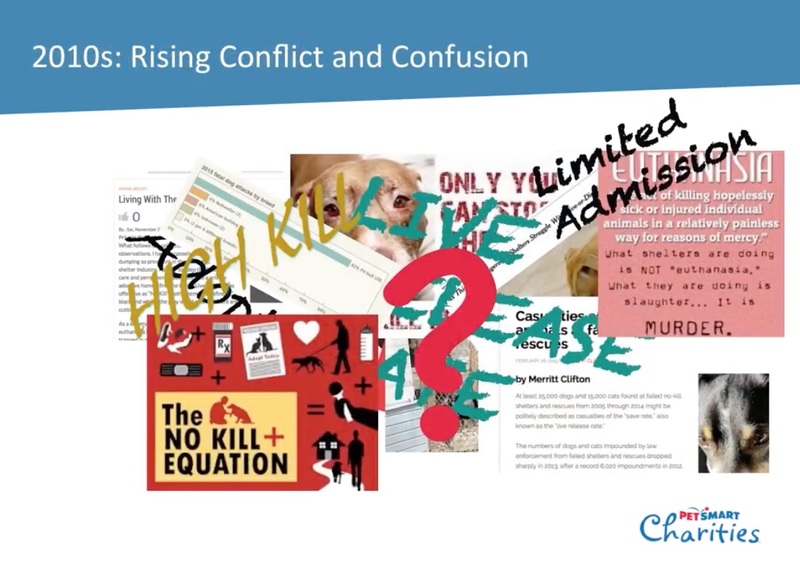 Slide: we're just so conflicted and confused. Won't somebody think of the pets? I was looking around the world for some innovative ideas... when you look at the US(A) we're hugely fragmented in this (rescue) space, but down in Australia a number of years ago they recognised and managed to get everyone to go under one name, one brand, one organisation, called the RSPCA. And it's been a really good thing. It hasn't been perfect, but it's been a really good thing. And they've been able to provide resources, raise more money for that organisation and keep a consistent message for the public in a way that seems to be quite effective. And now when I look at what's going on in Australia, in a lot of ways they're way ahead of us. They even now have been able to do such complex things such as have standardised behaviour assessments for all of the shelters. And when you start to think about the power of all being under one roof, it becomes pretty important. Right. Ok not at all right. Not all rescues in Australia are RSPCA branded and supported. And while being generous in allowing an international speaker errors about our local situation here, the question I think needs to be asked is.... where did Dr Haston get this information? Even a cursory google would have revealed that, this isn't the case; so someone must have been chatting to him about beneficial strategies being used in Oz. Now he's the keynote speaker for the RSPCA's conference. Huh. Adoption revenue has become so important for so many organisations in this country, especially in these high demand markets, where they may go down to Texas and pay a source shelter (read = pound) $25 or $50 to transfer a puppy up say to Colorado, where they'll adopt it for $300 - $400... and that's really good, it helps out the source shelter, they're (the rescue is) able to raise a bunch of money that they can apply to medical and behaviour. However, if you think about how much money that is - if you do the simple math that we had a half million dogs change location, $400 for an adoption fee - they paid $50 - that works out to over a $100 million dollars. And anytime you get significant money like this involved, it also attracts bad actors and it's creating a phenomenon called "retail rescue". These are organisations who are fronting as 501C3s, that are essentially going to puppy mills, or are part of the puppy mills, buying dogs off auction floors or moving dogs from puppy mills, bringing them in to a state like Colorado, adopting them for very high fees, with very little concern for the well-being of those animals; it's simply become a money making proposition. And you see this a lot in the north-east, you see it a lot in Colorado, you see it a lot in the pacific north west; in fact there was a piece in the Washington post detailing the problems we have around this issue of retail rescue. The thing about small rescues is that they're big and they're unregulated. This map is from Petsmart charities; we have 3,600 partners all over the country, most of them are quite small. It is estimated that there is between 10,000 and 20,000 small rescues. I think the quote I heard was a small rescue is born every 2.5 seconds. So they're big and they're unregulated and they're hard to control, and we're starting to see an awful lot of issues starting to come up around that, and one of them really is, is it a rescue, or it is a hoarder. 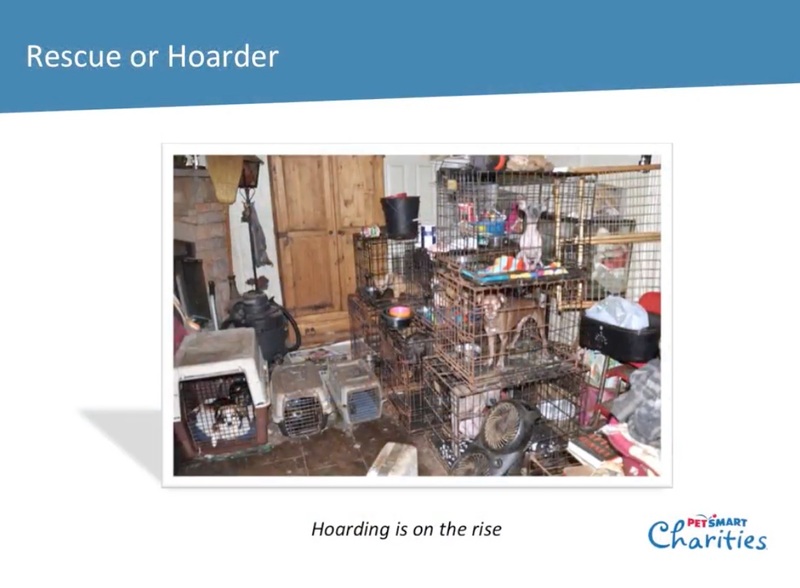 The increase in hoarders, especially coming out of groups that started with good intention is significant. And becoming a bigger and bigger issue, where you're seeing seizures and groups like ASPCA and others having to come in and intervene in groups who have lost control. And that's not to say that rescues don't do a lot of good work; there are some tremendous rescues out there that are fantastic resources for the sheltering (read = pound) infrastructure but they have to be integrated into that sheltering infrastructure. When they start operating simply on their own, we start to see some bad, negative consequences happen, and a lot of that results in some bad conditions for animals. Dr Haston sends a dire warning about allowing rescue groups to thrive without the hand of guidance from more 'competent' organisations. And draws a direct comparison between rescue groups and puppy farm brokers. 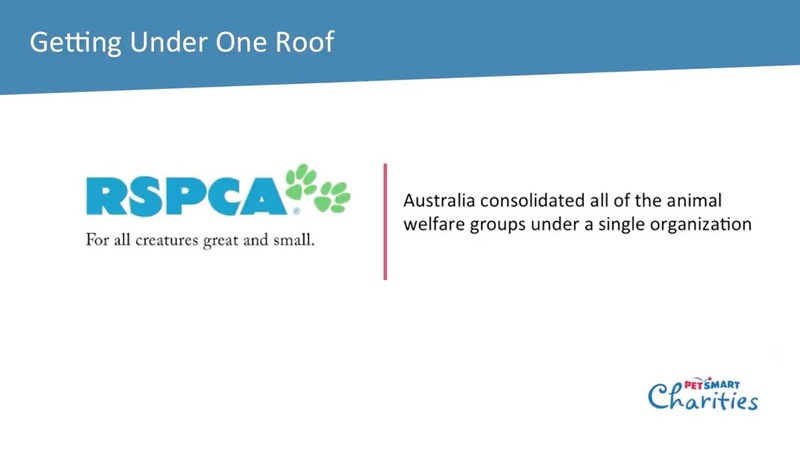 It would be fair to assume that this aligns strongly with the RSPCA belief that rescue group = hoarder/puppy farmer in disguise, as seen in Victoria where rescue groups were literally lumped in with puppy farmers in state legislation. And where rescue groups - being good guys doing the right thing - were supportive of same. Undeniably to their detriment as they are now forced to operate within unworkable parameters designed to thwart puppy farmers. With Dr Haston coming to Australia to run down run rescue groups, and give big ups to the RSPCA position that all rescues should fall under their brand and be regulated by them, can we assume that he knows something we don't... yet? Is the legislation seen in Victoria a proposed national position of the RSPCA? Is the RSPCA pulling out of pounds themselves, the first step in a program to co-opt rescue groups to do this work for them? Is rescue at real risk of in Australia?